Germantown Commissary is within walking distance of my office. They will definitely be serving me a pulled pork sandwich and sweet tea for lunch today. You are making me hungry!!! Christina's dad took me to this place in Southlake, Texas, called Feedstore BBQ for my introduction to TX BBQ. I went in with LOW expectations, but came away a believer. I hate to say it, but it was damn good. I have to keep telling myself that it is ok to like TX BBQ given the fact that we are dealing with 2 different animals. I will probably end up talking to my therapist about this. After reading his email, I am interested in hearing more on Texas BBQ v. Memphis BBQ. Is one better than the other? If so, why? Can you even compare them, or are they just two different beasts? Leave some comments, folks. Inquiring minds want to know. Dad visited this weekend, and after hearing how much my sister, brother, and sister-in-law enjoyed Opie's and after all the times I've raved about it, he wanted some Opie's. Russell, always Man-Up dependable, joined. Thus was born Man Up's visit #3 to Opie's. For me, this trip to Opie's was like all previous ones: fantastic (save for the fact that when I took out my camera to capture the spread before us, I found out my batteries were dead; Russell's cell phone saved the day; pictures are not great, but were it not for the phone, we'd have no pics at all). It remains my favorite BBQ joint. Dad, too, was not disappointed. But the real success of this trip was that it made Russell a believer in the wholesome goodness that is Opie's. His thoughts: "After a 48-hr waiting period, as to make the review of Opies visit #3 as scientific and rational as possible, I feel comfortable in saying that Opie's on Saturday grilled up as good (and as plump and juicy) a pork chop as I've eaten to date, ever. 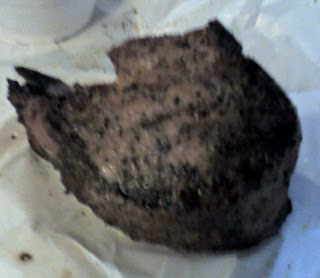 I give the pork chop a 9.99, and it is now my undisputed item of choice at Opies. When you couple that big chop with the incredible sides and atmosphere, Opie's becomes real hard to beat, especially since it's only a beautiful 30 min drive from the ATX. The good people of Opie's even offered to show any college football game we cared to watch on their large, well-placed flat screens! I still can't really recommend the brisket or sausage, but in my humble opinion, it is time to man up and give visit #3 to Opies a real solid overall 9.90." See the reviews from Man Up's first and second trips to Opie's. my co-worker also though that was the best beef rib he's ever had. See the official posts from Man Up's trip to Louie Mueller: Review, Pics, More pics, Meat, Beef ribs. Thus far, we've tried four of Texas Monthly's Top 5 BBQ joints for 2008 (and plan to hit up #1 soon). Fortunately for us, they were all within 45 minutes from Austin. Apparently there is good BBQ to be found outside of the Hill Country. As such, here is a map of TM's Top 50 for 2008. "Scientists have discovered that going veggie could be bad for your brain-with those on a meat-free diet six times more likely to suffer brain shrinkage." And, no, I will not be posting any studies to the contrary. Now that I'm caught up on posting reviews, it seems like a good time for an accounting of the scores to date. I'll post standings from time to time. Here are the average overall scores, highest to lowest, thus far. Granted, the makeup of the reviewers was not consistent, so it's not apples-to-apples comparisons, but it'll have to do. The 36-mile drive to Louie Mueller Barbecue in Taylor, Texas, was not the most scenic, but it was absolutely worth it. Louie Mueller was a gem. Like walking into City Marking (Luling) or Smitty's (Lockhart), you know you're in for a treat when you step through the doors of Louie Mueller and take a breath. And it was not downhill from there. This former gymnasium's walls are now blackened by the smoke from the pit (Be sure to check out the wall of business cards stained brown from the smoke. ), adorned with old pictures, memorabilia, and barbecue awards/recognitions (of which they have won many, including a spot in Texas Monthly's Top 5 for 2008). Also reminiscent of Smitty's, we sweated while we stood in line. Fortunately, the drinks are to left of the line, so you may help yourself to a drink while you wait. When we made it to the counter to order, we were pleased to have brisket samples waiting for us on our trays. The bite-sized brisket affirmed our suspicion that we were in for a great meal. (By the way, you've gotta love a place whose menu is handwritten on paper taped to the wall.) We also knew that we'd better brought our A-Game, after seeing the beef ribs, appropriately described by Amir as "elephant ribs" and as "14-ounce filets on bones." Huge. Lance Kirkpatrick single-handedly handled all of the meat cutting, while his friendly wife Jamie worked the register. Great folks. We (Amir, Drew, Jason, Jenny, Russell, and Todd) ordered moist brisket, turkey, pork loin, pork ribs, beef ribs, sausage, chipotle sausage, and jalapeño sausage. Russell weighs in first: "My friends, Louie Mueller's legendary BBQ was likely my favorite TX BBQ joint to date. Loved the authentic Texas atmosphere, including the cold Shiner Bock in mason jar mugs, the bench seating, the breeze blowing that smoky brisket smell all throughout the place. The whole place has sort of an old-fashioned Texas barn-dance feel to it. While it's not exactly a scenic drive through the hill country or anything to get up there, I still highly recommend making the trip out NE of the ATX every chance you get and just straight manning up on one of those monstrous, rhino-size beef ribs. Beef Ribs: huge, almost 'elephant-sized' as Amir so appropriately pointed out, and yet very tender and tasty; clearly, my recommended dish at Mueller's; Moist Brisket: tender and you don't need no stinking sauce. Pork Ribs: nice and moist, but a bit too peppery for my taste. Pork Loin: theirs is actually relatively moist as this item goes. Turkey: I'm not much of a bird-eater by nature, but there's was pretty flavorful and moist. Overall: my closest to that elusive perfect 10 yet---this may well be the ultimate man-up dining experience. Bottom line: The beef ribs and moist brisket at Louie Mueller's in Taylor is what manning up on Texas BBQ is all about. And that's a stone-cold lock that you can man up by." Jason concurs: "I too will have to agree with Russell and say this is the best place I've been to so far. The customer service was excellent; very kind people; getting a taste of brisket while we wait too. Price point on this place is by far the most affordable bbq place I've been to as well. I even manned up and got left overs; and i must say even after reheating the rib and turkey i got; it was excellent! Brisket was very good... i like mine to be more fatty; but for what i had it was excellent! Turkey... wow on the turkey; excellent; very juicy and moist and great flavor. you can taste the brine! Pork ribs were very tender, flavor was def. unique; i enjoyed it but not as much as Smitty's but you can't really compare the two. Pork Lion was amazing; very most; i love the fatty piece i got! I was a fan of the pork; glad i got seconds. Sausage that I got to try was pretty good; i tried the chipotle and it had great flavor. Overall i was a fan of this place; the atmoshpere of the resturant was nice as well. I'd def. make the trip out there again!" It was Jenny's first time to man up, and man up she did: "I can still smell brisket in my hair and feel like I'm more of a man now. Beef ribs were the best thing on the menu. They are HUGE and tasty and require at least two tooth-picks postprandial secondary to the abundance of cracked pepper. The pork ribs did nothing to excite my taste buds. Chipotle Sausage made my taste buds happy. I liked the kick at the end. Jalapeño Sausage had a good flavor and an awkward green hue, but it falls apart and isn't as juicy its chipotle fried. Customer service was excellent. But, really, my favorite part was the ice cold Shiner Bock on tap, served in a mason jar." It was Amir's first time, as well. Great to have Amir on board, except for the fact that hanging around Amir makes you realize how much less cool you are. At any rate, we hope Amir continues to take part. His thoughts on his first Man-Up outing: "My first man-up dining experience was a good one! The drive to Taylor was very easy and the company (and music) was good! (I think it is worth noting that you folks are way too generous with your scores. 9.375 is a very good score! You fatties keep mentioning the elusive 'perfect 10.' Well think about your scoring!!! 9.99 is really no different than 10...that is so close to a perfect 10 that it might as well be! Chill out with the scoring fatties!) Beef ribs: didn't have them...but the rest of you fatties sure liked them! Moist brisket: very good, but I have had better. Pork ribs: good ribs, but no where near as good as the st louis ribs from Rudy's. Pork Loin: very moist. Turkey: yummy goodness! The atmosphere and ambiance at Louie Mueller's is awesome! We will be hard pressed to find a better TX BBQ dining environment. The food was very good, but there is better bbq out there." Todd begs to differ: "I write tonight with a heavy heart. Today I learned that Mr. Mueller passed away this weekend. Early Saturday morning, only hours before we visited his pride and joy. Bobby Mueller certainly continued his father's great tradition of amazing BBQ. What a great legacy to leave behind, a hard-working, strong-loving family that excepts nothing less than the best. This rating is dedicated to the Mueller family, you're in my thoughts and prayers. When we arrived to Louie Mueller's Saturday afternoon, we were greeted by the incredibly sweet smell of gool ol' fashioned bbq. The smell that takes about 50 years to generate. The historic building is a perfect compliment to the history of the Mueller's bbq secrets. Everything in this place is historic, even to the smoke-colored business cards that line the wall. I strongly recommend that you have at least one beef rib (by far the best I have ever had. simply put, a steak sitting atop a bone, amazing!). Then, if you still have room move on the the moist brisket, followed by the turkey and pork ribs. I ordered 2 beef ribs, 3 pork ribs, and 1/3 lb of moist brisket...I 'manned-up,' so don't be afraid to go crazy! (by the way, that is like 3lbs of meat) This is my first and only perfect 10. Everything in this place is good, but the beef ribs and overall experience put it over the top, and in a league of it's own. enjoy fellow bbq-ers!" Bobby Mueller, owner and pit master of one Louie Mueller Barbecue, passed away Saturday. Man-Up offers its condolences to Mr. Mueller's loved ones. Ironically, we ate at his place for the first time on Saturday. All of us have eaten many times at Rudy’s, but this was our first Man-Up meal. I have been a Rudy’s fan since Day 1, but Texans regularly scoff at my Rudy’s praise, noting its chain status and that I need to broaden my BBQ horizons. Well, I’ve broadened my horizons. Would Rudy’s measure up? Would I still sing its praises, after trying the best of Lockhart, Luling, Spicewood, and Driftwood? Since there’s a Rudy’s less than a mile from Chaparral Stadium (with locations throughout Texas), where we were going to take in the Lake Travis at Westlake football game, putting Rudy’s on the Man-Up itinerary was an easy decision. Texas barbecue and Texas high school football was, as we knew it would be, a Thursday evening well spent. In my opinion, the strengths of Rudy’s are the pork ribs and the sides. I am not a creamed corn guy, but theirs is fantastic. The beans and sauce (“sause”) are good, and their slaw is second to none. Also, to be so lean (and dry), the extra lean brisket (my usual order) has great flavor. Man-Up's second visit to Opie's Barbecue in Spicewood was, overall, much more successful than our first visit. (For yours truly, it was no different than our first trip: a perfect 10). Maybe a couple of weeks to reflect upon the error of their ways paid off, in terms of overall scores. Maybe during the visits, everyone grew some taste buds. Or maybe everyone was just really hungry from two hours at Krause Springs. Whatever the reason, Opie's was a Labor Day crowd pleaser. Master Parish shares his thoughts: "great, authentic Texas atmosphere, situated in one of my favorite parts of the scenic Texas Hill Country, this place blows you away with the heavy, hard-wood furniture greeting you as you walk away from the counter with your hand-selected meats and home-cooked side dishes, such as tater tot casserole and spicy corn…the meat had room for improvement the last time I was out there, and improve it did, as the brisket and pork loin were several notches in flavor and moistness above what I experienced last time I was out there…the ribs (both regular pork ribs and sweet/spicy pork riblets) are in my mind the staple of the menu here…the ribs are magical and ranked 9.3 on the RP scale this time…I rank the brisket a 6.8 this trip since, while good when dowsed with the sauce, it's still not nearly on par with that of the Lockhart or Luling joints…the enormous and delicious banana pudding and the excellent blackberry cobbler can add tremendous value to your trip…would still be kind of tempting for me to bypass this place and keep right on going on the scenic drive out to Llano for some Coopers; but, with the price of fuel these days, Opie's is growing on me for west-71 BBQ." You're getting there, Russell. Keep at it. And now from Todd: "I visited Opie's of Spicewood once again this weekend after a delightful dip in Krause Springs. There was definite improvement over my first trip, but I still don't think it will crack my top 5. I had the pork ribs and the brisket and was impressed. The ribs were good, pulling in a strong rating of 8.8. I still hold Kruez ribs in first place, but Opies made a strong showing. The brisket was much better the second time around, pulling a ranking of 8.05. It was juicy and moist, perfect for a sandwich. The overall experience helps Opie's. The drive from Austin is beautiful and the heavy wooden chairs are about as manly as you can get, i.e., you must be a man to move them! I give my second trip to Opie's an overall rating of 8.99."